Underneath all the current noise around temporary foreign workers are a couple basic truths. One is that people who need money and work will always be drawn toward countries that appear to have an abundance of both. The other is that people already settled in those countries will find ways to exploit that desire. And so we have this latest news of Israelis lured to Canada to work in mall kiosks, falsely promised wages and sales volumes the likes of which many Canadians would be happy to earn themselves. But of course, events didn't unfold like that, and now we are neck-deep in embarrassing allegations of modern-day slavery and an astounding absence of regulatory oversight. My perspective on temporary workers has changed significantly since my time in Honduras, where I saw things from the other side of the line. Legal or illegal, a job in a land like Canada or the United States changes everything for the families who suddenly have access to money they could never hope to earn in their own land. I'm quite sure that any one of us could be converted into people who would enter another country illegally if it meant the bills would get paid and the kids would be fed and clothed. Developed countries worry a lot about migrants sneaking into their countries to take under-the-counter work and then staying. But what I saw in Honduras was that many, many migrants returned home after four or five years, having earned enough money to build their house, launch their business, put their children through decent schools. That seemed especially true among illegal migrants, who often had quite focused plans about where they were going to go, how they were prepared to live while there (low-cost to the extreme) and how they would use the money they'd be sending back home. There's a style of house in Honduras that I came to think of as "U.S. Migrant" because its higher quality and North-American influenced design made those very attractive, well-built houses stand out so much from those around them. From the receiving country's perspective, the discussion almost always goes fairly quickly to the question of migrants "taking good (insert country here) jobs," or lowering work standards because they work for less and aren't able to complain if some of the working conditions are breaking the law. Much of the news coverage of the exploited Israelis is portraying the matter as one of employer exploitation and lack of regulatory oversight, but underneath such issues is always the lingering question of whether such jobs really needed to be shopped out internationally in the first place. 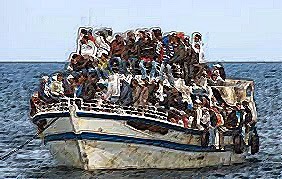 Having heard countless hair-raising stories as to what people are prepared to do to sneak into another country if it means they'll find well-paid work, I am now of the view that there's no way a developed country is ever going to build a wall high enough to stop the flow across its borders of people seeking a better future. I am also of the view that human nature being what it is, there will be no end to people who seek their own better future by exploiting the basic desires of desperate people to have a better life. During our time in Honduras, there was a tragic news story about a scam involving fictional temporary jobs in Canada that left dozens of struggling Honduran families destitute. They'd sold land, borrowed from their families, done whatever they had to do to raise money for huge fees for the supposed work program, only to find out the program didn't exist. What to do? Short of wishing on a star for an end to global poverty and unscrupulous people, I think all you can do is look at the reality of things and act accordingly. Canada can't stop gullible people from other lands from believing some scamster's story that our country is the pot of gold at the end of the rainbow, but it can prevent said scamster from simply doing whatever he wants once the people arrive. Canada has the regulations and laws needed to prevent such exploitation, but what recent high-profile cases are revealing is that we no longer seem to have the will or the resources to enact them. That's a pretty big problem. And were it all up to me, I would create more legitimate temporary-worker programs. Nothing I saw coming out of development aid in Honduras rivalled the economic power of the country's migrant tradition. A fifth of the country's GDP comes from money being sent home by Hondurans working outside the country, legally or illegally. Why not help countries like Honduras at the grassroots level by permitting more people to come here to work for four or five years? As for "good Canadian jobs," we have no one but ourselves and our poor choices of governments to credit for the deterioration of that vision. Free trade may be better for the world, but it's not better for workers in the developed country jobbing out the work. Salaries have stagnated while costs have soared. I know, because I remember how my first husband and I, at the tender ages of 21 and 17, managed a household, a child, a mortgage, two cars and an annual holiday to somewhere like Disneyland or Hawaii on his resource-industry salary. How many young couples could say the same nowadays? As a nation made up almost completely of migrants, Canadians should know more than most that there's no stopping the drive to seek greener pastures. People are going to come. But surely there are better ways to manage that reality more effectively than to cut regulatory services to the bone and then act surprised when desperate foreigners pack their bags anyway and bad people lead them astray. No comments in three days. Guess your views are not that popular on this subject. Except with me. I applaud you for speaking out. People tend to forget (or ignore) that people are people all over the world. Our neo-whatever governments in Canada are out to screw us. Might as well help the other downtroddens while we have the chance. Keep it going jody! One disgusting feature of the corporate sponsored free trade agreements is that they definitely free up the ability of capital to move across borders but at the same time thanks to the war on a word (terror) the ability of people to move around becomes more and more constrained. For those who need a work abroad, You can try to find some online job ads Australia because I found my job there.